"Pablo Casals once called George Enescu 'the greatest musical phenomenon since Mozart' - and with considerable justification. Enescu, like Mozart, displayed extraordinary abilities at an early age and continued to demonstrate his genius throughout a remarkable career. In his mid-teens, Enescu studied composition in Paris with Jules Massenet and Gabriel Fauré, alongside classmates including Maurice Ravel. Before he reached twenty, he was conducting his own works back in Bucharest where he was already hailed as a major force in Romanian music. At that point, and through much of his career, Enescu's own music wasn't his main calling card. It was his violin. By the time World War I began, Enescu had traveled much of Europe as a renowned violin virtuoso, and beginning in the 1920s his itinerary expanded to include the United States. In 1925, one of his appearances inspired the young violinist Yehudi Menuhin, who sought Enescu out and studied with him for many years. Throughout his career, and even at the height of his fame as a performer, Enescu led two very different musical lives. During the concert season, he was based in Paris and crisscrossed the world giving concerts and recitals. In the off-season, he retreated to the Romanian countryside to compose, eventually completing an impressive catalog of works ranging from large scale symphonies and orchestral suites, to chamber works and music for his own use as a violinist. 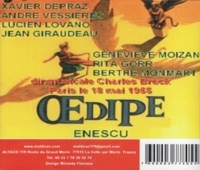 Yet despite the variety of his output, there was one work that was Enescu's musical companion for more than two decades: his single opera, OEDIPE. Enescu began the opera in 1910 after seeing a production of OEDIPUS THE KING, the classic drama by Sophocles. The opera's libretto, written in French by Edmond Fleg, incorporates elements of all three dramas known as Sophocles' â€˜Theban Playsâ€™, and also uses other legends surrounding its title character, giving Enescu's OEDIPE one of the few narratives that covers the entire life of Oedipus. Enescu continued to be acclaimed as a virtuoso performer, but his reputation as a composer grew as his career progressed. He died in 1955 and by now, he's widely regarded as his country's greatest musician, with OEDIPE often hailed as the finest single work ever composed by a Romanian." 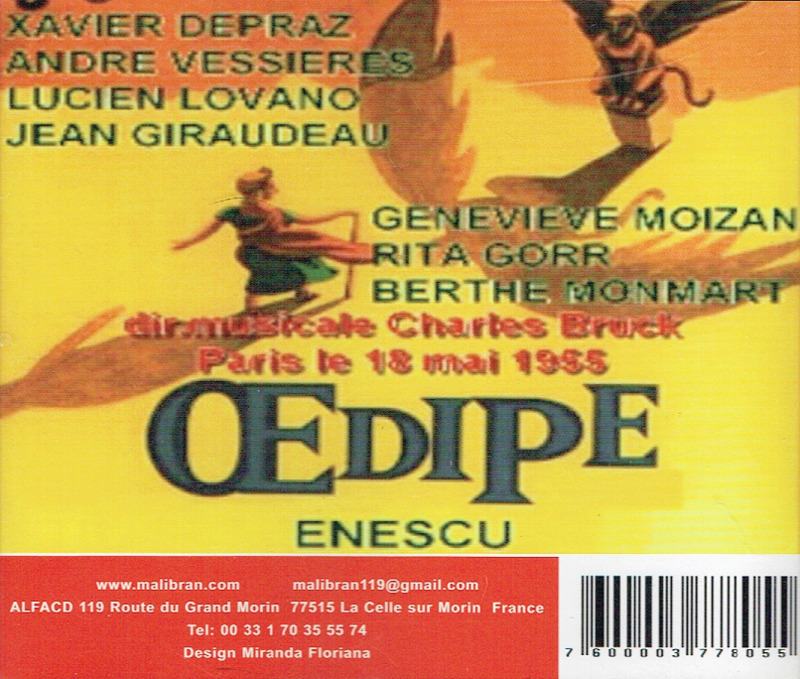 "Romanian composer George Enescu's 1931 opera OEDIPE is an epic work on several levels, including its dramatic scope - from the protagonist's birth to his death - and in the huge performing forces it requires. It stands for the most part outside the modernist or post-Romantic operatic conventions of its time and inhabits a sound world that uses a familiar harmonic language, but in idiosyncratic ways. The composer's Romanian roots and the influences of impressionism are in strong evidence, but the work isn't easily pigeonholed; it has moments of rough folkloric primitivism, meltingly lush romanticism, elegant delicacy, and surprising experimental techniques. 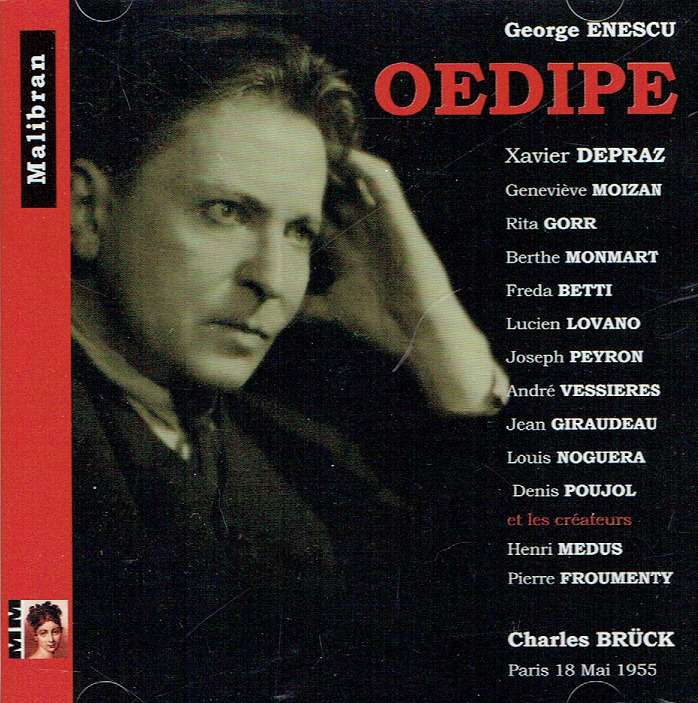 OEDIPE was Enescu's only opera, but he shows a sure hand in the vividness of his musical characterizations and in creating dramatic tension, which the story has in abundance. The opera's finale is absolutely stunning, with wave after wave of surging, astonishing grandeur that finally subsides into an ending of breathtaking serenity. OEDIPE clearly has the musical and dramatic values to merit serious consideration for revival by adventurous companies, and exploration by fans of modern opera." "...the French bass Xavier Depraz had a warm basso cantante voice which darkened a little in its bottom register, opening out into a lower extension quite unusual for its type, enabling him to sing Mozart's bass roles convincingly....He is a touching Don Quichotte, a role he could have been born to sing....Nilakantha's stanzas from LAKME are beautiful....one of his best roles [is] Basile in the Opéra-Comique version of BARBIERE...."
"Charles Bruck, a Hungarian-French conductor, was born in Timisoara, Hungary (now Romania), in 1911. He became a French citizen and was active in the Résistance, and was made an officer in the French Legion of Honor.